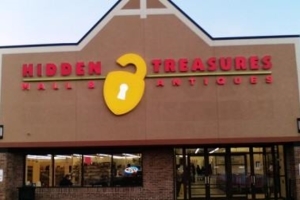 Hidden Treasures is the LARGEST vendor & antique mall in the Rockford, IL area! We carry a unique collection of Antiques, Vintage, Primitive, Retro, Crafts , Collectibles, Vinyl Records, Vintage Furniture and much more. It can all be found in our 37,500 sq. ft. showroom. We have over 250 different vendors that are always providing an ever changing inventory. When looking for that one of a kind piece for the home or a unique gift, make Hidden Treasures your go to destination. Since we opened our doors in December of 2014 we have become a great destination in Northern Illinois and the best place around for vendors to showcase their unique creations and finds. Hidden Treasures was recently named on the Best Of Illinois Website www.bestthingsil.com as one of The 10 Best Antique Stores in Illinois!